When I started collecting Pelikan fountain pens, I was overwhelmed by the variety available. So many options exists that it is difficult to know how to proceed, especially for a newcomer to the brand. Where is the best place to start? Unfortunately, no road map exists and many of us have learned a little from our peers and a lot from diving in head first. I decided to write this post for anyone considering purchasing a Pelikan fountain pen. Perhaps you are contemplating your first purchase or maybe even a second, third, or more. The decision to invest in the brand is the easy part as these are great pens from a storied brand that carry on a long tradition of quality. Many people seem to own more than one Pelikan and collectors and users alike know all too well that Pelikan fountain pens seem to multiply right under their noses. The difficult part of the decision-making process lies in deciding which Pelikan to get as there are so many choices available. Should one go for a modern pen or a vintage model? What are the pros and cons of each route? What other considerations are there? 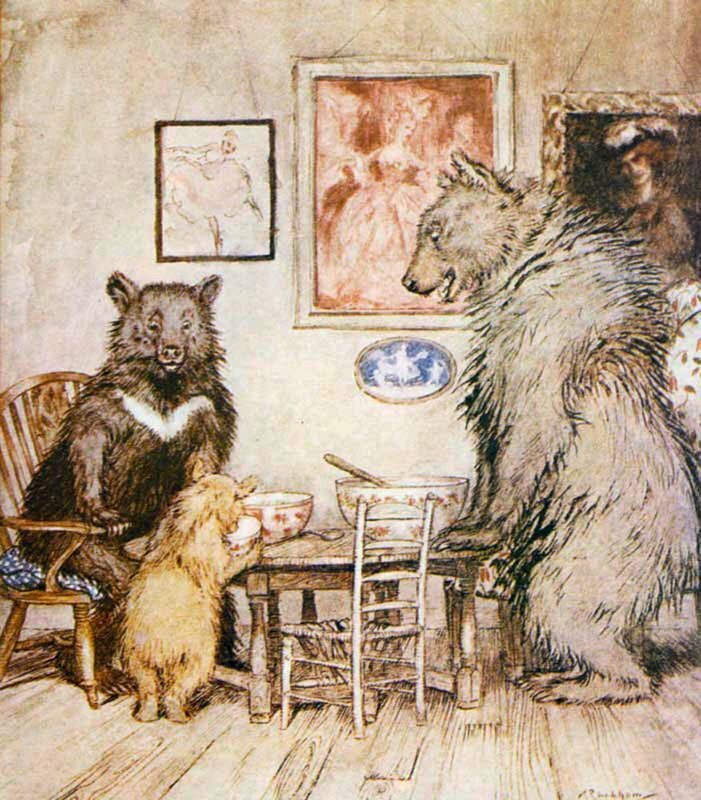 I recently read the story of Goldilocks and the Three Bears to my soon to be two year old son and thought how applicable Goldilocks’ experience was to buying a Pelikan fountain pen. One model can be too big, another too small, and yet another too light or too heavy. With the scarcity of brick and mortar pen shops today, it can be very difficult to try before you buy resulting in so many of our purchasing decisions relying solely on descriptions, photos, and reviews. It can be very difficult to find that “just right” match on the first purchase. With what follows, I hope to give you a little perspective on the Pelikan landscape so that you may better navigate between the various models and make a more informed decision with your purchase. In the discussion that ensues, I will try to highlight some of the larger topics and bring to the forefront some of the issues to consider when deciding on a purchase. I will also give a few suggestions regarding appropriate models to consider, particularly pertinent for someone new to the brand. What I won’t do is tell you which pen is best since that is such a subjective valuation and will vary from person to person. With each model discussed, I will try to provide an average price ($$$) that these pens are bringing in today’s market. Please understand that this is just an average and a guide. Because so many factors affect a pen’s retail value, your mileage will vary. This is a broad topic and what follows is only meant to be a primer. I’m sure that I have missed a few worthy details and, if that is the case, please do bring them to my attention in the comments section below. Where applicable, I will link the text to articles previously published on this site which will provide more in-depth information should you wish to read further. The first major factor to consider needs to be whether or not you should go for a modern pen or something from the vintage catalogue. Vintage is a term that is very loosely thrown around the pen community so, to be clear, I define a vintage Pelikan as any pen made prior to 1970. After that date, you really are in the modern era of production in terms of techniques and materials. Working backwards then, we will start our discussion with a look at modern fountain pens. By virtue of being manufactured in the past 45 years, these pens generally utilize modern manufacturing techniques and materials. They are of sturdy construction and have largely held up well to date. When buying a used pen from the modern era, you generally don’t have to question whether or not the pen will function, it usually just does. Buying a pen brand new obviously would ensure that you are getting a model not previously used which provides much reassurance but can also be very expensive. Also, don’t expect all new purchases to be the latest incarnation of a pen. Pelikan’s lines undergo small changes from time to time (e.g. all rhodium nibs on the x05 models or plated cap tops circa 2010) and many dealers can have old stock linger around those transition points. Model numbers in the modern lines will largely indicate size and trim (many exceptions exist). As a rule, model numbers ending in Mxx0 have gold trim and those ending in Mx05 have palladium. Because of their durability, pens of this era can be found at a discount on the used market and can frequently be purchased with confidence provided that they were even marginally maintained by the previous owner. Since these are piston or cartridge fillers, there are no worries of corroded sacs or refurbishing that are common to offerings from other brands. 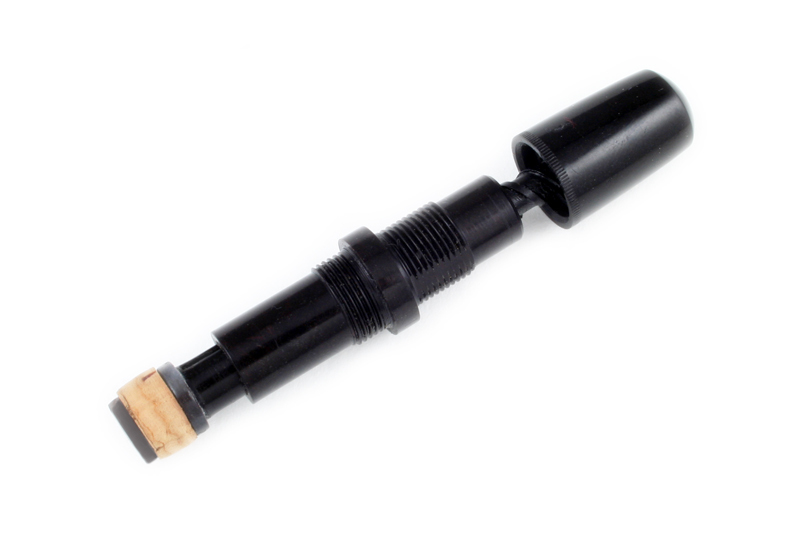 The modern synthetic piston seals are quite durable and have shown longevity thus far. Used pens often simply require a thorough cleaning as well as lubrication of the piston assembly. Key things to look for when purchasing a pen would be the condition of the nib, barrel, cap, and furniture. 1) If it is a Souverän made after 1997, look to the trim ring at the section as these can corrode with time and ongoing exposure to ink. The M400 only had the trim ring added after the line was updated in 1997 but the M600s included the section trim ring even prior to their redesign. 2) As mentioned above, Pelikan redesigned their lines in 1997. For the Classic series, that meant transitioning from derby cap tops to crown cap tops. Early in the run of derby cap tops, a solid plastic thread was used which had a tendency to crack. It was ultimately replaced by a threaded brass insert. If dropped, the derby cap tops could crack. 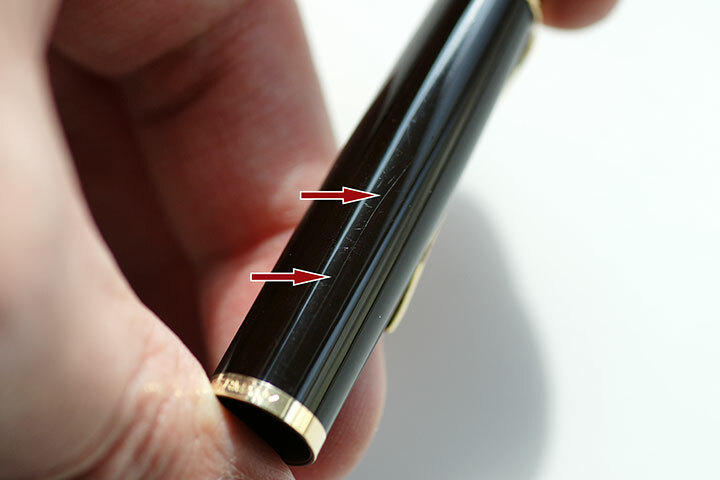 3) One final consideration for both modern and vintage pens would be micro scratches. With regular use of any pen, these are to be expected. They are not deep scratches and you should not be able to get your finger nail into them. Often times they can be polished out if one desires. These can accumulate to excess in a pen that has seen regular and faithful service and you will have to decide what your level of comfort is. Micro scratches don’t often impact a sale in my experience unless excessive. If the piston moves and it passes the visual inspection, you are likely looking at a viable pen. Pelikan divides their modern upscale fountain pen offerings into the Classic series which are more affordable, less polished entry-level lines and the Souverän series which are their higher end luxury offerings. Classic: ($95-165) The Classic series fills the role of an upscale though still entry-level Pelikan. These lines include the M100, M150, M200, M205, M215, and M250. Each of these pens are similar with subtle distinctions largely based around nib materials, size, finishes, and furniture. The M1xx line is generally preferred by those who like smaller pens. That said, they balance well when posted and I find them easy to use even with somewhat larger hands. The pens in the M2xx line are more of a standard size but still small by today’s standards. They are in fact the same size as the Souverän M400 and come in a variety of finishes. These pens are solid performers with nice, springy stainless steel nibs, all except for the M250 which was equipped with a 14C nib. Make no mistake about it though, these pens are light in weight and may not appeal to those who prefer a heftier pen. The M215 remedies this to some extent by including a metal barrel with added heft. Most of these lines are now discontinued but you can still purchase the M150, M200, and M205 new while finding left over stock of M215’s. Many of the more interesting finishes are no longer in production and will have to be sought on the used market while M100’s and M250’s are only available used. They can still be found with some frequency, many even as new old stock, and are well worth seeking out. You can explore all of the available models and variations in the Classic series in this site’s database. Souverän: ($250-700) This is Pelikan’s luxury line and the pens in this category are priced accordingly. When you upgrade from the Classic series, you get a higher level of trim, gold nibs, and a more polished finish. Also with this series comes a stepwise increase in size and weight. This line is composed of the M3xx, M4xx, M6xx, M8xx, and M10xx. As you step up in model, you also increase in size and price until you get to the M1000, Pelikan’s flagship. These models have a more upscale look, come in Pelikan’s traditional striped finishes, and are no less durable despite their luxury status. Because these pens come in such a variety of sizes and weights, there likely is a Souverän to fit anyones taste and comfort level. As a general rule, the M3xx line is tiny, dwarfed by the M4xx which is a standard sized pen. The M6xx has a little more length and width but remains light and nimble. The M8xx and M10xx are larger still and incorporate brass piston assemblies giving them a significant heft without being heavy. Fitting a Souverän in the budget will likely be the biggest barrier to acquisition but deals can be had if you are willing to search for a gently used model. Purchasing a vintage pen is not nearly as clear-cut as purchasing a modern one. These pens have seen more use (86 years for the oldest of the lot) and were made during a time when materials and manufacturing techniques weren’t as mature as they are today. That said, a vintage Pelikan fountain pen is still well worth the pursuit provided that you keep a few salient points in mind. 1) The earliest pens in this category like the 100 and 100N were made with hard rubber components which can experience color shifts (brown discoloration) as well as become brittle over time. Caps, sections, and piston knobs should be inspected closely on these older models. While perhaps less aesthetically pleasing, the color change in no way affects function and largely cannot be undone. 2) Pelikan’s vintage offerings came with ebonite (hard rubber) feeds characterized by longitudinal fins. This is a porous plastic that is perfectly suited to the function of a feed and is regarded as superior to modern plastic feeds. Unfortunately ebonite feeds required machining and are less robust in terms of strength when compared with modern plastics. These can be easily broken when dropped or damaged in the act of removing a nib if one is not careful. They remain just as faithful today as when produced though and even a feed with slightly damaged fins can continue to function unimpaired. 3) Earlier models will have a cork seal which Pelikan employed until around 1940 when cork became difficult to source during war-time. Unless a pen has been recently and properly re-corked, it will almost certainly need to be replaced and care taken to maintain. A pen utilizing a cork seal may not be the right choice for a first time buyer but it should certainly not be something to be afraid of either. Later synthetic seals were a big improvement but these too have been observed to fail with time. Following cork, Pelikan moved to a neoprene compound that has been associated with shrinkage, a problem not often discovered until after purchase. If you find ink leaking out of the back of the barrel or a pen that won’t fill, an incompetent piston seal is the first thing to consider. Thankfully, these early synthetic seals can be replaced by several pen repair specialists. 4) The 400/N/NN as well as other models of that time had a metal liner inside of the cap. This performed its function of preventing the nib from drying out beautifully but, unfortunately, as the plastic of the cap has shrunk over time, the metal liner has not. 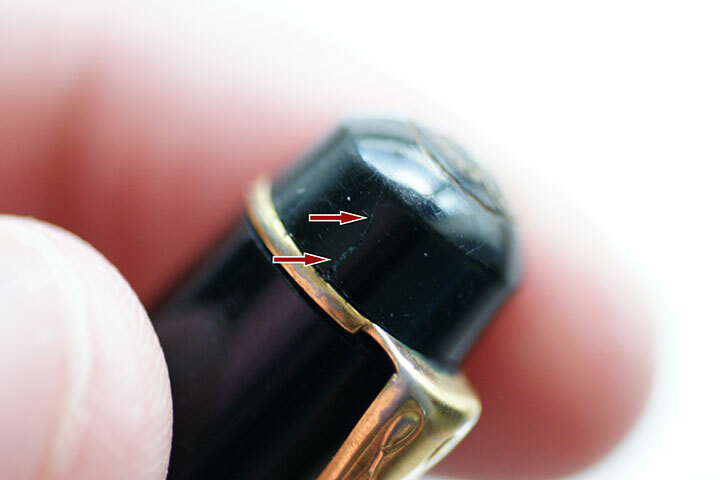 This has resulted in hairline cracks (referred to as hairlines) in many caps which is a common and well documented problem. It should be looked for prior to purchase but small hairlines won’t affect functionality or harm anything. 5) Several models such as the 400NN, 120, and 140 were equipped with polystyrene collars which was a short-lived trend in the 50’s and 60’s. This is now known to have been a poor design choice as the plastic has become incredibly brittle over time and all will invariably fail in my experience at some point. Replacement collars are available and other work arounds exist but a failed collar can cause headache and should be something that you are aware of if you are pursuing any of the afflicted pens. 6) Brassing, the wearing of plating from the furniture to reveal the metal underneath, is also something to keep in mind. Depending on how well the pen was cared for, how much it was used, or how it may have laid in storage, this will be seen to varying degrees on vintage models. It is more of a cosmetic issue but certainly degrades the appearance and value of a pen. While it has no functional impact, not much can be done to remedy it if present. While the above all sounds like doom and gloom in the vintage arena, this really is not the case. These are simply some of the things to look for when contemplating a vintage purchase. Most Pelikans from this era have been well cared for and have held up beautifully and will continue to hold up with the proper care. Many spectacular examples are out there. With the knowledge of what to look for and what to expect, your vintage pen purchasing should be much easier. 100/100N: ($165) These are great pens that have a rich history and are small by today’s standards but available with some phenomenal nibs. They are the ones that you may find with cork pistons and hard rubber components so care needs to be taken when selecting one. I think every Pelikan enthusiast should own one at some point but this is not the pen that I would start with if you are new to the brand. 120: ($40) This is a school pen with a gold-plated stainless steel nib. It was only available in a few finishes and saw two distinct production runs over its life (1955-65 and 1973-77). It is not the flashiest pen ever but it certainly is a dependable one. They can be solid writers without all of the adornment of the higher end production models which frequently makes them available at affordable prices. 140: ($80) This would be high on my list of recommendations to first time Pelikan purchasers looking to go the vintage route. The pen is smaller but it posts well and has a great feel in the hand. The nibs are phenomenal and the writing experience is generally a total joy. These are usually low maintenance and get the job done. The 140s have an understated appearance that belie their big capability. Ibis: ($75) Perhaps not the first vintage pen to seek out but one well worth trying. The post-war versions were no longer made of hard rubber and can frequently be found for sale in excellent condition and quite reasonably priced. I’m always amazed that these don’t command more at sale. This was a lower end line put out by Gunther Wagner but you wouldn’t know it based on the writing experience. 400/N/NN: ($150) This is the number one pen that I would recommend to anyone looking to get into vintage Pelikans. They are styled beautifully, are dependable, and remain relatively low maintenance and functional many decades later. The nibs are a treat to use and can really add joy and flourish to your writing. The 400NN is found in particular abundance on the used market and while prices vary, can be picked up very reasonably with some patience. If you can only have one vintage Pelikan pen, this is probably the one to get. With the issue of modern versus vintage addressed, we are left with just a few smaller details that I would like to make mention of. I personally prefer a piston filling pen for its ease of use, ease of cleaning, and large volume ink capacity. That doesn’t mean I don’t respect the cartridge/converter pens or acknowledge their place in the pen community. Pelikan has put out many great models of cartridge pens which are often much more affordable than their piston filling cousins and I’ll detail just a few here. P200/205: ($130) These two models are the newer kids on the block, modeled after the M200 and M205 fountain pens. They are cartridge pens that look very similar to their piston filling brethren except they have a slight variation in trim and the nib is not interchangeable. They remain reliable, modern cartridge pens that do their job well provided you favor a light pen. Twist: ($10) The Twist is also one of Pelikan’s more recent offerings, available in a variety of interesting and fun colors. This pen has an ergonomic grip section which some find comfortable and others don’t. If a triangular grip does not appeal to you, this is not the pen for you. This model also lacks a clip and is a little bulky but the stainless steel nib is smooth and gives solid performance making it worthy of mention. It is also a relatively inexpensive pen making it easy to experiment with. Pelikano: ($20) Following the 120 described above, the Pelikano is a school pen that has had many incarnations over the years. These have great nibs, are durable, and don’t fail to perform when called upon. Deals can be had on the used market and they are well worth the investment if you find a version that suits you. Silvexa: ($30) This model came in both piston and cartridge variants. Like the Pelikano, these perform well but have a little more of a sophisticated, grown up look to them. Not overly popular which also makes them not overly expensive, they were a solid line of pens that are an excellent avenue to pursue. Pelikan’s nibs deserve their own small discussion. Today’s modern offerings are limited and you will only find current production models coming with EF, F, M, and B nibs from the factory. In addition to that, these nibs are generally firm with a significant amount of tipping material that makes them write somewhat wider than their designation and without any significant line variation. A good rule of thumb, more so for the gold nibs than stainless steel, is to order one size smaller than is your actual interest so as to not be disappointed by the broadness of the line. Despite this unflattering description today’s nibs are reliable for the most part and put down a wonderfully smooth and wet line. They do the job as designed and that significant amount of tipping does allow for easy grinding/customization. Today’s nibs can’t help but pale in comparison to Pelikan’s vintage nibs which are, in my opinion, second to none. These older nibs have significantly less tipping material but are wonderfully springy to semi-flexible for the most part. They are responsive and provide a nice character to your writing. In terms of enjoyment, these vintage nibs make writing a real treat. 1995-Present: These are generally the firm nibs with generous tipping described above. They will certainly get the job done as advertised but are all business and won’t add any significant flourish to your writing out of the box. The lines are wide and wet which makes for a very smooth writing experience but sometimes drier inks are needed to tame the flow. You can still find obliques and triple broads earlier along this date range but they have been phased out over the last several years. 1980-1995: These nibs aren’t hindered by a large blob of tipping material, have spring, and are fun to write with. Pelikan still offered obliques at this time as well as very broad nibs so there is a lot of variety out there not present in the company’s more recent offerings. These are the nibs I enjoy most from the modern era of production. Pre-1980: Specifically, I would focus on the logo nibs from 1954-1965 here. The flat, stubbish tipping gives a nice line variation out of the box and you can often find semi-flexible or greater nibs if that is your taste. Not all are created equal though and you may have to try a few to find one that works for you. Once you do, it likely won’t be your last foray into Pelikan’s vintage nib offerings. The ‘script’ nibs from 1929-1954 are also a treat and should not be discounted as they largely have the same characteristics, I just personally have less experience with them. One thing that everyone should keep in mind is that any pen purchase needs to take into account additional work that may be needed. Nibs, even on modern, brand new pens may need some work or even tuning by a nib meister before they write to their full potential. No quality control is infallible and pens with misaligned tines or other issues have been well documented on the fountain pen forums. I expect this is the minority experience but one you should be prepared to encounter. Pelikan does allow 30 day nib exchanges on new purchases via their distributor, Chartpak. Vintage pens may have unseen damage or need a new seal that would incur additional cost. I factor in and plan for an additional $50 to every second-hand pen purchase that I make just in the event issues do arise. Often times they don’t but anyone who is serious about buying and enjoying a pen to its fullest should be prepared for additional expenses. This is particularly applicable to used pens purchased from venues like eBay and the like. Even if a pen is advertised as “restored” assume that it isn’t unless you are provided definitive proof that the pen was handled by a qualified restorer. This is not the case when purchasing from a well-known retailer who stands behind a restoration and offers some form of warranty. Rick Propas for instance of The PENguin stands behind his pens and while they are often more expensive than what you might find elsewhere, they come with the backing of a Pelikan guru and should be expected to work on delivery as advertised. The extra investment certainly can be worth the peace of mind that it buys. It is up to you to decide what your budget will allow and what you are comfortable with. As you gain experience with the brand, it becomes much easier to purchase pens that may require some additional work to restore functionality. If you are just starting out with the brand, stick to safer waters to ensure the best pen purchasing experience possible. An excellent article. Well done! Excellent overview and a lot of sound advice. Thank you. I agree with you completely on the 400NN. I might go as far as to say if I could only have one Pelikan, it would be a 400NN; though there would be stiff competition from the higher end Souveräns. I also think very highly of the 140 line. I was able to get one for $80, but the rest have been a little bit above that in the low to mid $100s. The prices, of course, fluctuate. Your words above on the Silvexa apply equally to the rolled gold M30s. Their relative lack of popularity surprises me because they are excellent and unique looking (vis-à-vis other Pelikans). They also have slip/push on caps, which make them great edc/work pens. The only negatives might be their not being as easy to maintain (nib swapping and piston greasing) and that the plastic used to make them might not be as robust as that of some other Pelikans. Thank you very much for your comments. I agree that if I too could only have one pen, the 400NN would likely be the one I would choose (thankfully we don’t have to choose). I appreciate your comments on the M30. Pelikan has made a lot of great pens that have gone under the radar making them very affordable. Useful. Looks like I paid too much for a 120 and got the right price for an M150. What I find from watching pens on eBay is that there seems to be a price gap between any Pelikan with a striped/striated green barrel and the cheaper models. Nice blog. I may be back with questions when I get around to reviewing my Pelikans! I’m glad that you found the post useful. I wouldn’t necessarily say that you paid too much. Those prices are really just rough estimates. I determined them based on historical experience as well as looking at an average of all sold eBay listings for that pen over the past month. These are generally unrestored pieces which is why I indicated that the prices are just loose estimates. The market fluctuates and condition will dictate a lot. Feel free to come back anytime and I’m also happy to answer individual questions via the Contact Form. Great work Joshua, a very informative piece which I will return to when making my next Pelikan purchase. I can certainly validate your comments about Rick Propas. Rick recommended a vintage 400 which I subsequently bought. The nib is simply superb. I keep coming back to it after all the Pilots, Sailors, Viscontis and Montblancs have made their way through my rotation. Has the art that went into that nib been lost or has nib making just moved on? What do you think? Thank you Tony. I’m glad that you find the piece informative. Rick is great and it’s good to hear that you enjoy your 400 so much. These vintage nibs are my favorite by far. To answer your question, I think that nib making has just moved on. Companies today have to cater to the majority. Sadly, that is not us in the enthusiasts community. So many of these pens are given as gifts to novices too used to writing with ballpoints. My thought is that the nibs of today are made firm and with such rounded tipping to accommodate those neophyte users. The company has to do what it can to mitigate against nib failures/returns. It is unfortunate but a sign of the times in which we live. Would vintage nibs really be that night and day of a difference for your average novice/bp user? As long as they understand and can be trained not to press down too much, more than half the battle is won. Plus, many or most bps don’t require the force to write with that they did in the past. It is sad because vintage Pelikan nibs are as good as it gets. Pelikan is my favorite brand even without considering vintage pens; but on nibs alone, I’d take modern Pilot and Sailor nibs over modern Pelikan nibs. I share your sentiments but don’t see a change in philosophy/manufacturing coming anytime soon. Great site and article. I’m new(er) to fountain pens and would love to snag a vintage Pelikan…any other sites to check out besides Rick’s? Thank you very much. A vintage Pelikan is well worth tracking down. Other sites to check out would most definitely be Martiniauctions.com and GoPens just to name two. You can find links to both sites and many others under my links page. Thank you for the kind words! I’m glad that you like the article. Enjoy that 400NN tortoise. It’s a great pen. Thank you for your kind words Nuno. That 100N sounds like a great memento to remember your grandfather by. I do recommend seeking expert repair services given the sentimental value of the pen. I don’t specialize in these vintage models so am not versed in all of the repair experts out there. Might I suggest that you contact Rick Propas of the PENguin as these older pens are his specialty. If he cannot assist you, I’m sure he can point you in the right direction. Good luck with the restoration. Well-written article, whether the reader is a novice or a veteran aficionado. Thank you! I just purchased a used 400 green-striped rollerball from the early 90’s. I really appreciate good rollerballs and hope that the Pelikan rollerball cartridges work effectively. I have been using Parker rollerball cartridges with great success. What is your opinion of the 400 rollerball models? You’re welcome! I have a few rollerballs though I prefer the fountain pens. The rollerballs all use Pelikan’s 338 cartridge and come in black or blue and fine, medium, or large. I find that the refills tend to skip a bit but I’m largely satisfied and have never had any significant problems. Joshua, I didn’t know where exactly to address this. Perhaps you can advise me where to direct my inquiries. But I am looking for an M2XX Blue-Marbled Pelikan fountain pen, in new or like new condition. I know these were reissued a few years back, and I have seen several on eBay. I have concerns about buying on eBay, though. I would like to establish some contacts for my forays into buying 2nd-hand Pelikans. I’ve also read that Rick Propas is a highly-respected collector and might be able to direct me to a source. I don’t know quite how to break into this aspect of the market, as I am a new collector. Would you be able to advise me on this, please? Also, if I should direct my inquiries elsewhere, please let me know where. I have sent you some potential leads via e-mail so check your inbox. Thanks to Joshua for graciously supplying me with resources. Dear Joshua excellent blog post as always and very informative. I do not believe I have ever seen you discuss or write about the Pelikan Ductus. Perhaps I am wrong, but I think many of us would be interested in your thoughts on this Pelikan model. Thank you for the kind sentiments Lawrence. All of my posts are driven by my experiences and my interest. I can’t say that I have ever explored a Ductus personally. This is mostly due to my personal bias against cartridge pens. Consequently, I don’t own one and therefore have little chance to explore and speak authoritatively about it. I will certainly keep your suggestion in mind and see what I can do in the future. Thanks for the suggestion. It was a pleasure to read a concise, yet thorough review and one that confirms I did not go overboard in my purchases. Very nice site, and hope to read more soon. Thank you for the kind words. Glad that you found the post useful. As a recent enthusiast, I found this post to be clear and concise. Thank you! I truly appreciate it when people willingly and ably share information. My limited forays so far have been into Japanese pens which I adore as someone with small hands and extremely small writing. I am afraid I made my first Pelikan purchase based solely on falling head over heels in love with the looks (it was a Cafe Creme). It was my first international purchase and it cost me far more than it should for the the pen, the shipping and customs. In addition, it did not write well out of the box which was terrifying for me. It is now fine thanks to advice garnered here and there by others who also share advice. It says something about the brand that none of the above has dissuaded me from wanting to purchase another one (love is blind?) I feel better educated all round with this post under my belt! P.S. Regardless of the mistakes I made with the Cafe Creme, it remains one of my favourites. There are so many knowledgeable pen people but I remain heart driven–at the end of the day, regardless of how perfect the pen is, I need to love it. Thank you so much and I’m glad that you found the post useful. The Café Crème is one of the best M200s released over the last several years, in my humble opinion, so it’s great that you were able to get one and that it suits you. I always hate hearing about people who get a new Pelikan with a bum wing. Awesome that you were able to get it fixed up though. I hope you enjoy it for a long time to come. Look forward to hearing about the next addition to your fledgling flock. I unexpectedly came into some money today–and spent it tonight on a M600. I found your articles AFTER I bought it and I was not discouraged, it sounds like it might be just right for me. I am keeping my fingers crossed that both wings work! Congrats on the M600! That is a great pen. Hope that you enjoy. It’s amazing how quickly a flock can start to expand. Kim, I know exactly what you mean. I’m also heart-driven (good term!). I only own a couple of Pelikans, but I love them, and I know I will buy more in the future. Luckily for me, mine did write great right out of the box. Even if they didn’t, I’d still love their designs, and would do whatever necessary to get them writing well. My most recent bird buy was the PINK (!) M600 Souveran, fine point. Have you seen it? For those not crazy about pink, it’s not their cup of tea, but I’m totally head over heels. Glad to welcome a new Pelikan addict! Have fun with your affliction. Yes, I did see the pink and it was tempting despite the packaging; however my pink quest is the Visconti Venus in rose gold which I cannot find to purchase on this continent (so far) so I opted for the red striped Pelikan because I don’t have any red pens so far. Well that was Freudian, how that “so far” just glided right out of the keys. I am afraid this pen thing has gotten into my bloodstream. Sorry, it was rude to say despite the packaging! My apologies. I realize that many might think it was fun and zany and everyone is entitled to their opinions and loves. It was a bit too much for me is all. In today’s day and age of equality and political correctness coupled with the frequently encountered gender issues, I was suprised at the packaging from a marketing standpoint. Just didn’t seem to be in keeping with the times but I don’t think that it has hurt sales any. That pink M600 did not appeal to me at first but neither die the Taupe M205. These birds have a way of growing on me though and I’ve kind of come around. Joshua – about being politically correct concerning gender issues – you said it exactly like I wanted to. I was also surprised at the approach Pelikan used, marketing the pink M600 specifically toward women. In fact, I think I even saw where it was marketed as a “ladies pen.” Not sure if that came from Pelikan or somewhere else. In any case, I am definitely a girly-girl, and I love pink, so the pen appealed to me from the start. This dates me, but I remember LOTS of things being marketed toward women, sometimes in very offensive ways. So this campaign did not offend me at all. Some younger women might have different takes on it. I suppose it depends on each woman’s personal experience of gender-specific issues. You wouldn’t happen to know any details about the souverän range’s product numbers? When I’m shopping around online for a Pelikan M600 green/black with medium nib I see it listed with different product numbers which is rather confusing. For example on amazon.co.uk I have found it with number 980029, on amazon.de 977538 and 980029. Same on other places. Don’t get too hung up on the model numbers. Each model, finish, and nib size has a unique number. I’m not sure if there are regional differences as well. They really have no meaning outside of the catalog/retailer price sheet. Hope that helps. Thank you. This was a very timely piece for me at least. Still a newbie, even though I’ve been using fountain pens for some time now, till recently not had a reason to consider a Pelikan. The main reason was the absence of a brick -and – mortar store… For some reason I felt that without first touching and trying a Pelikan (or for that matter a Visconti etc) I may make a serious mistake. The trial and errors of my current set of pens decided things for me. I still don’t have access to a local shop but through this article I think I’m better informed. Again thank you. I’m glad that you were able to find my post and that it was useful to you. A Pelikan makes for a great pen and I wish you luck on your selection and purchase. Unfortunately, the lack of brick and mortar options seems quite widespread and is a problem that I see no easy remedy for. Perhaps there is a pen show that might come through in an area not too far away from you or a pen group that meets which could allow you access to a variety of pens? Wonderful site! I’ve been using a Pelikan 120 Gunther and Wagner for years. Finally bought a 140 at my first pen show, and then had it ground to an xxxf by Pendleton Brown. I love it! The flexible nib is perfect. One question, I’ve read the 140 and 400 nibs are interchangeable, is there a size difference with the nib? Meaning will the nib look small in a 400? Also how much bigger is the 400? I’m thinking the 400 will be my next purchase. Thank you for the kind words about my site and congrats on the 140! The 140 and 400 nibs are interchangeable but there is a size difference. If you put a 140 nib on a 400, it will be a bit small looking and out of place. It will function perfectly fine though. The 400 would make an excellent next purchase. If you like the vintage pens, I’d suggest a 400NN but that’s just my personal preference. Enjoy your pens and the hunt for the next addition to the flock. Interesting article, though you may want to look again at your prices. Looking at Rick Propas’ prices, 100N goes for around $300, 400 (Tortoise) around $300, (Green 400 around $225). And those prices have been like that for quite some time now. I just purchased a 100N for $190 (different source) but the price difference may be because it has a rather humdrum CN nib. This is the first Pelikan I have ever seen in person (no shops in my country, only the internet for buying anything pen related). Although the pen is small when capped, it is a super usable size when posted – and I have large hands. Mine is in great condition – clear window, no cracks anywhere, no obvious brassing. So I guess I went a bit contrary to your advice about the first Pelikan to buy, but I did that before I read the article, and I am glad I did! Also, regarding flexibility. In my book, any pen requiring moderate to firm pressure in order to achieve line variation is not a real flexible nib. Just springy. Thanks David. As far as prices go, this is a very difficult thing to nail down. The prices that I listed were taken from a review of SOLD auctions on eBay. Rick is an excellent vendor whom I highly recommend. You know that you’re getting a reliable product that has been thoroughly gone over and has some support behind it. For that, you will pay a premium and therefore Rick’s prices are at the top end of the spectrum. Prices are only meant as a guide and really will vary by vendor and the specific circumstances of each pen. My prices are only meant as a general reference. There is nothing wrong with the CN nib. I have seen some of the best writers equipped with such a nib. Sorry to hear that you don’t have any pen shops in your area. Sadly that seems to be more and more in a lot of places. It is my opinion that these older Pelikans were made to be posted as they take on the perfect size and balance in that state while remaining imminently portable when capped. Sounds like you have a real beauty. I completely agree with your assessment of the nibs. I feel that there is a lot of over-hype about a nibs characteristics and that a great many nibs sold as “flexible” are oversold as such. I like a nice springy nib and have no use for flex which is why I love these older nibs so much. Had a good deal of trouble finding an article that laid it all out for me, like this did. Thank you. Great article. Hello Brandon. I’m really glad you found it useful. Please don’t hesitate to contact me should you have any additional questions. Excellent article. Thank you very much for posting this. Hi Nicholas. Glad that you found the post useful. Let me know if I can ever answer any additional questions for you. A very very well put together article indeed! Thanks for posting this. Just one small question – I recently acquired a Pelikan in the wild which looks exacly like the Pelikan 140 shown by you above. 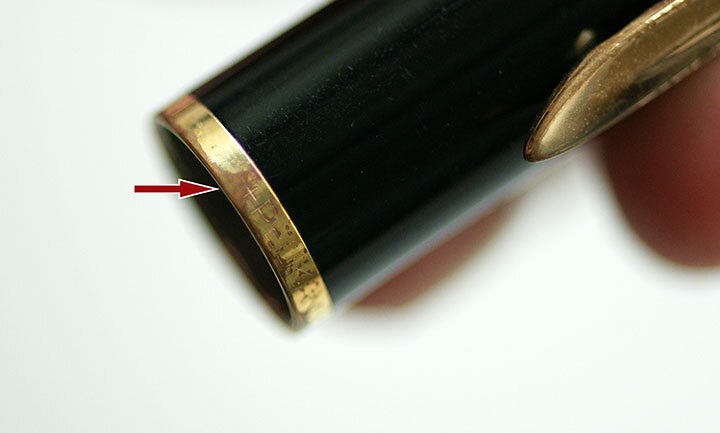 however, the cap band says “PELIKAN 440 GERMANY”. Could you please shed some light on this model. It has a responsive Extra Fine nib which is slightly flexible and smooth with ebonite fin type feed and is a delight to write with. Thanks! I sent you an email so you could shoot me a pic of the pen and cap band inscription. Are you sure that’s what it says? Do you have a loupe to look more closely? There is not now nor has there ever been a 440 model. Like I said, pics would go a long way to me assisting you. hi joshua, i cleaned the pen thoroughly today and it looks like the brassing on the cap band made the “1” look like “4”. it is in fact a pelikan 140! the EF nib is a true EF and not like the broad EF on modern Pelikans. 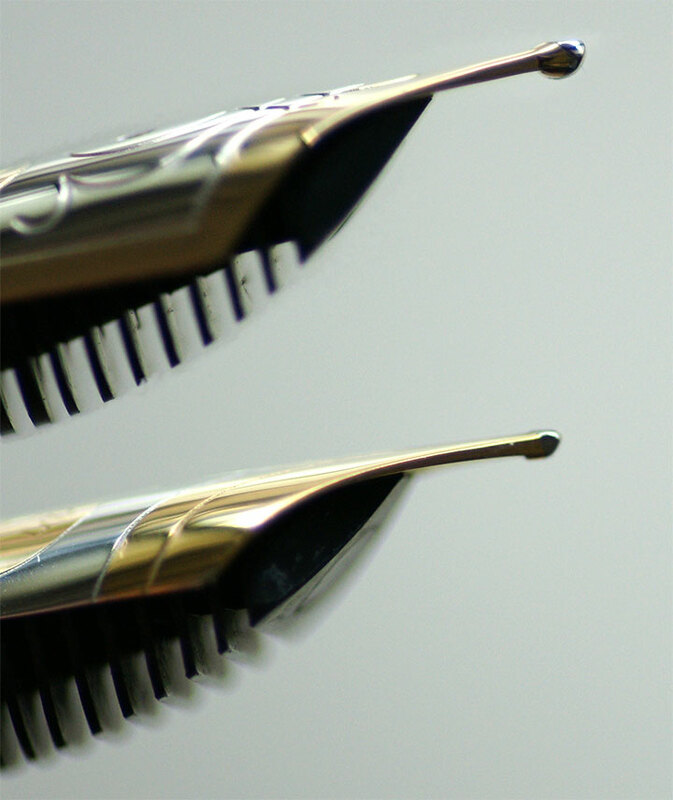 the nib is sloped downwards like a pilot posting nib; springy but still stiff enough for regular use. Glad to hear that you were able to sort it out. The brassing which is common on these can sometimes distort the writing. Enjoy your pen. Thanks for posting this excellent article on Pelikan pens! I don’t own one but am thinking about buying one. Your article was a delight to read and will help me making a buying decision. I will probably end up buying a new model and having the nib made into a stub. Thanks again! I’m glad that you found the article helpful Bill. Hopefully you’ll be able to make a more informed decision. Pelikan’s are great. Good luck tracking down your first one. This is an excellent article: I inherited my love for fountain pens from my father who passed away in 2012 at 93. 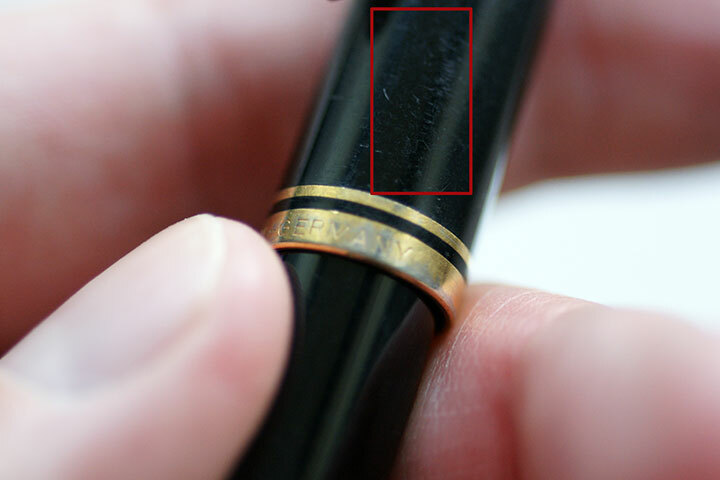 He owned a Pelikan #120 which still writes, though the body is now showing hairline cracks. I’m unable to get it repaired, in Bombay, India; where I live. I own a M200 M nib, and it’s excellent. I’ve always felt Mont Blanc pens’ reputations to be hyped when compared to the Pelikan series of pens! Thanks! I’m sorry to hear about your father but it’s great that he was able to pass on not only a love of fountain pens but a 120 with such sentimental value. Hi Joshua, it’s Rosen John again…I also own a Pelikano fountain pen- a cheaper version of the Souveran M200 which I purchased first….this one gets dry all too soon. Another problem plaguing this instrument is that it accommodates a cartridge as against a piston-driven one. Can I convert a cartridge driven pen to a piston driven one? The Pelikanos are usually very good writers. Are you sure that your nib and feed are properly flushed out? You can’t convert a cartridge pen to a piston one but you could purchase either a Pelikan or Schmidt converter which is a middle ground. Hope that helps. Thank you for your excellent article! I’m new to vintage pens, I started purchasing a few in 2017. I recently purchased two vintage birds this year thanks to your advice: a 1956 400NN in Brown Stripe and a 1953 100N Green Pearl (fine, flex!). Those are great pens. Sounds like your flock is coming along nicely. Glad to have helped out. Let me know if I can be of any assistance to you in the future. Someone’s selling an M481… and I find so little material about it on the net…. I don’t know if the USD105.00 price is reasonable for a used Pelikan. it would be my first Pelikan if ever I decide to buy it. ‘ would appreciate any inputs. Thanks. There is a paucity of info on the M481 out there. $105 is a very reasonable price in my opinion. It is essentially the predecessor to the M200. I’m a big fan of them personally. It would make an excellent and affordable entry into the brand. You can find additional information on my site here, here, and here if you haven’t already read through those. I have tried in the past to synthesize what we know of the M481. Hopefully it can be of some use to you. I am evaluating a purchase of a Pelikan 400, probably produced in early 80s. Nib and feeder are not screwed on the section, as many other Pelikan models. 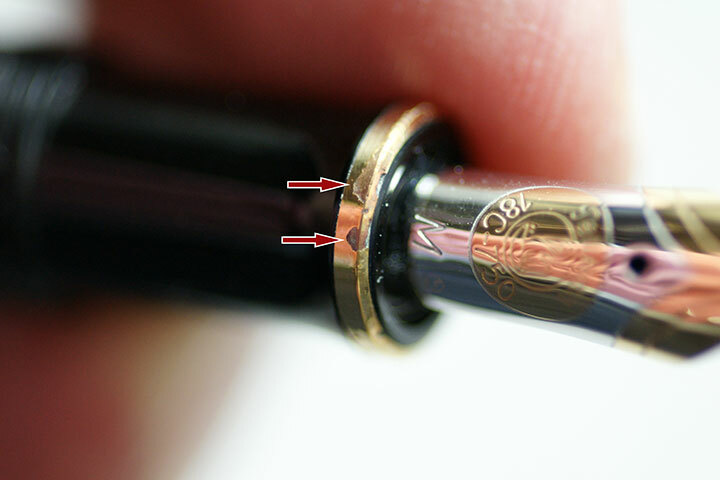 I read that for a short period of time Pelikan adopred this solution for connecting the nib to the section, before coming back to the usual screw – unscrew system. What is your opinion about the right price for this model? It is in a NOS status. Is its value similar to another 400 of the same period, or should it be more expensive? Ty very much for this very interesting site and blog! If it was produced in the 80s, then it’s an M400. There is a distinction. There were some early models that had a friction fit feed but it was a short lived experiment. Some models just have a cracked collar and the nib and feed just pull out. 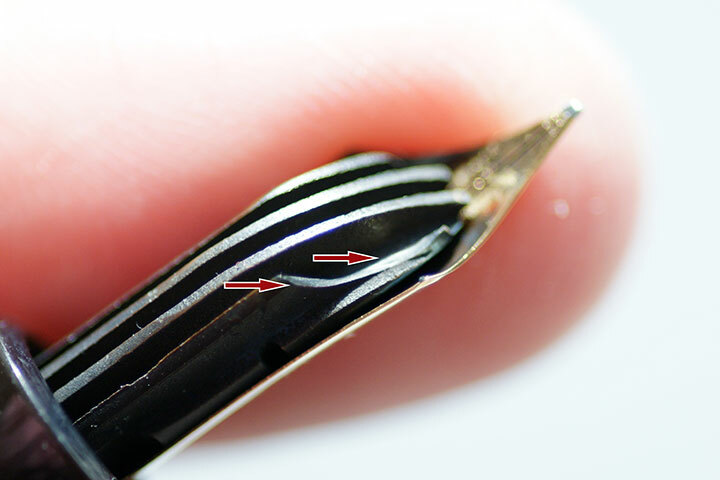 So make sure the nib unit has a collar when removed from the pen before declaring it a true friction fit. It’s more of an oddity. There are those that would pay a small premium. I don’t think that the cost would be too dissimilar from a standard M400 but with a friction fit feed, maybe expect to pay closer to the top end of the range. Sections can discolor depending on how they’ve been cared for over the years. Relates to sun exposure and prolonged exposure to moisture causing a chemical reaction. There are two schools of thought on this. 1) Leave it be and keep the pen original, allowing its age to show naturally. 2) Others choose to re-blacken the section with various products available out there. I think it’s a personal decision. My thoughts on it are as follows. I tend to try to find non-discolored examples. I treat these older birds with the reverence they deserve as far as care and maintenance so as to prolong the issue from developing if not already present. I do not believe in re-blackening but feel that if you do, you are obligated to advertise the pen as such if you ever go to sell it. Hello. I have an M200 with a nib that is misaligned. And I want to disassembly it. Do you recommend it? If so, where I find a guide to do it? It would depend on what you mean by “misaligned.” I would only recommend disassembling the nib, feed, and collar if you have the proper tools. Otherwise, it can be quite the headache. If it is simply the tines being misaligned, disassembly shouldn’t be necessary. Do you mean that the nib has shifted on the feed?